We’re still recovering from illness around here, so no sadly, new knitting to report here. But I just read a great post by Kate Atherley (Wise Hilda Knits) on the difference that a even a quarter of a stitch can can make in your gauge. So now I’m wondering if those tiny fraction-of-a-stitch-off measuring errors (even over a 4-inch swatch that you’ve oh-so-carefully measured) might contribute to the perceived inaccuracies of swatches. What do you think? So once you’ve done your swatch, figured out what needle gives you the fabric you like best and cast on the project, you’re good to go, right? Well, not always. You see, sometimes swatches lie. They don’t really mean to, they just can’t help it! You used the same needles that you’re going to use for the project. Not the same size needles, the same exact needles. I get very different gauges between the same size wood and metal needles, and I have even noticed differences in gauge between aluminum and nickel-plated metal needles. You made your swatch in the same way that you plan to knit the finished item (i.e., if you’re knitting your sweater in the round, you knit your swatch in the round as well). TECHknitting has an excellent post on circular swatching. You used the same stitch pattern that you will use for the actual pattern. If you’re making a heavily cabled sweater but worked your gauge swatch in stockinette, your finished sweater may fit your cat. 🙂 Usually the pattern will state the gauge and say “in stockinette stitch” or “in pattern stitch,” so you can calculate your gauge accordingly. You made your swatch large enough. Ideally you want your swatch to measure at least 6″ square. This gives you at least a one-inch margin around your 4″ measurements. You measured your swatch correctly. You want to measure the number of rows or stitches over 4″, not over 1 or 2″. Something that looks like 5 stitches per inch could be actually 19 or 21 stitches over 4″, which may not seem like a big difference but could translate to a 4″ (or more!) difference in the size of your sweater!! You measured away from the edges of your swatch. Cast on and bound off edges often have a different tension than the rest of your stitches. If you used a different stitch pattern along the edges to keep your swatch from curling, this will likely alter your gauge near those edges. You washed your swatch. Some yarns— like superwash wools or yarns with silk in them— will grow when washed. A lot. Wouldn’t you rather know that now, before you knit the whole sweater, bound off, knit the button bands and sewed on the buttons? But what if you did all that, and still realize that your gauge is off once you start knitting? How could that happen? Well, it might be you. If you’ve been knitting socks at a tight gauge and then start a sweater in chunky wool, you might unconsciously strive for a tighter gauge. Maybe you knit your swatch while relaxing in front of the tv, but now you’re knitting on your lunch break, in the middle of a stressful project at work. Or maybe— and I think this is what happened with my Lanesplitter— you get a different gauge when knitting a small swatch than you do when you’re knitting a project that involves scooting a lot of stitches around your needles. The gauge on my swatch was 20 stitches per 4 inches but once I cast on my 130 stitches and started knitting, I found my gauge was 19.5 stitches over 4″. And this new gauge is for unwashed fabric. I expect my gauge to be slightly looser after the finished skirt is washed and blocked, so the final gauge will probably be something like 19 stitches per inch. 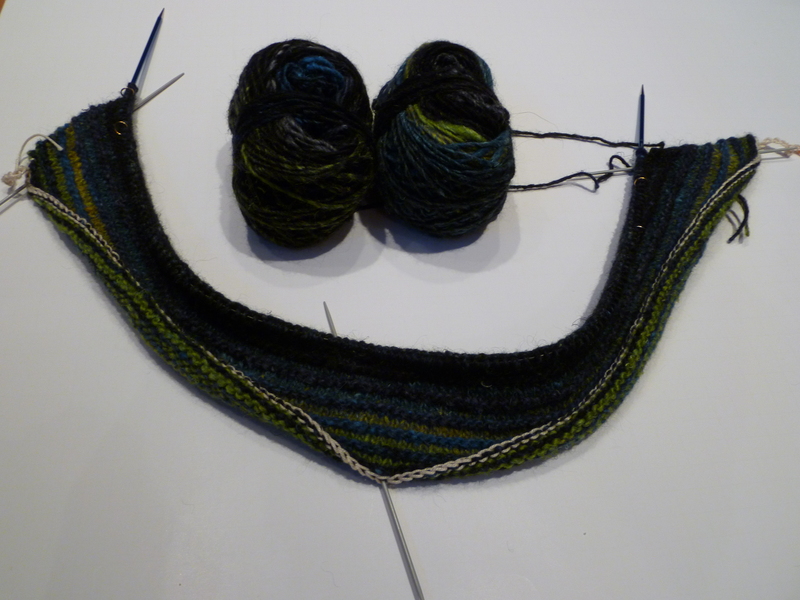 So what do you do when your knitting gauge is different from your swatch gauge? Well, this is why you should check your actual gauge while you’re knitting. Ideally, you should do this several inches away from the row currently on the needles, for the same reasons that you should measure away from the edges. If you can’t do this, slip your stitches to some waste yarn and then measure. If gauge is really critical for this project, you can wash and block your work while the stitches are being held by the waste yarn (make sure the waste yarn is white or very light-colored, so there’s no chance of the dye transferring to your project) and then measure again. In some cases (a hat band that’s too small to go around the recipient’s head), you’ll have to frog your work and start over. But you’ll have more experience with the yarn and can cast on with more confidence this time, knowing that you have a better chance of getting the right size! In other cases— especially if the gauge differences aren’t too great— you can adjust the pattern as needed. If you’re knitting a fitted pullover, for example, you could add extra increases or decreases to your waist shaping (and/or start the shaping a little sooner or later). What did I decide to do about my Lanesplitter? Well, I cast on 130 stitches, so this means I expected the width to be 26″, but instead it’s 26.7″ and will likely grow to 27.4″ after blocking, so 1.4″ difference. I’m knitting this on the diagonal, so this indicates that my skirt is going to be approximately 1″ longer than I’d planned. 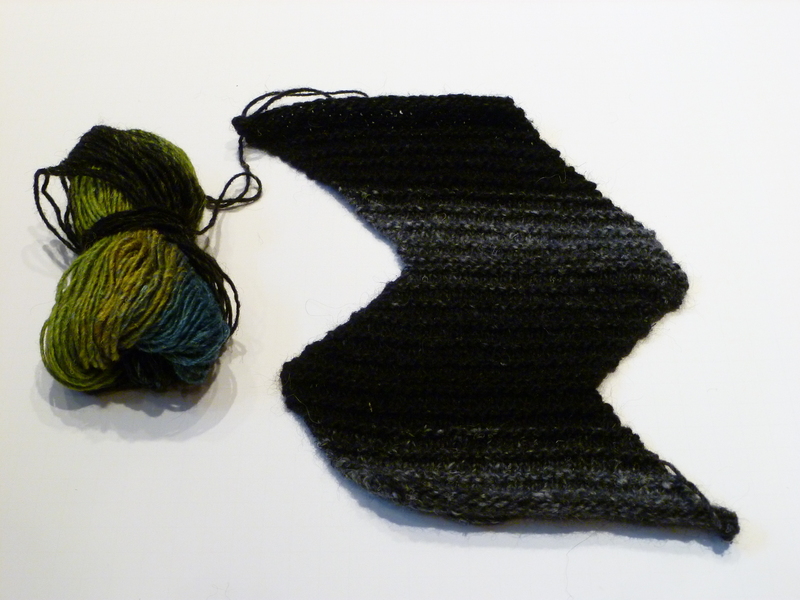 But the width is determined by the number of rows that I knit, so I will still be able to achieve the fit that I want. For these reasons, I’m going to keep knitting. Once I have a few more inches knit, I’ll be able to hold it up to me and see where it’s going to fall, and then I’ll make a decision. So tell me… are there any swatching secrets that I’ve missed? Have you found other reasons why your gauge might change between swatch and actual project? Swatching is one of those things that knitters either love or hate. I think it depends on the kind of projects you knit, and how often you’ve been burned by bad gauge. If you knit scarves or things where gauge is largely irrelevant, then probably swatching isn’t a big part of your knitting life. But if you knit sweaters or things where fit is important, then it only takes one ill-fitting sweater (and all the days or months that went into knitting it) to make you see the value of swatching. For my Lanesplitter skirt, gauge is important. I don’t want my skirt to fall down while I’m wearing it, and I’d prefer it to end just above my knee. I’d also like it to be long enough to be legal and to fit without looking like I’m wearing a striped sausage casing. Tall order, eh? Having worked with Noro’s thick-and-thin yarns before, I know that I tend to prefer them knit up at a slightly tighter than normal gauge. I also don’t want this skirt to stretch all out of shape while I’m wearing it, so that’s another reason to work to a tighter gauge. The pattern calls for size 10 needles; I would ordinarily start with size 8 needles for this yarn. I started my swatch with size 7 needles. As expected, the fabric was drapey and had lots of stretch. Too much stretch, actually, which indicated I should go down a needle size. So I changed to a size 6 needle. As I expected, my resulting swatch was much softer and had more drape after a bath than it did when it first came off my needles. I’ve decided to go with the size 5 needles.